He warned Brussels will not be “intimidated” by Britons who try to blame the EU for their inability to secure the Brexit deal they want. 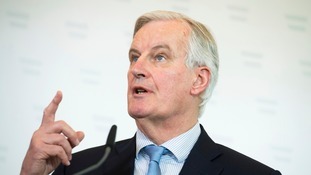 The EU’s chief Brexit negotiator urged rapid movement on the vexed issue ahead of this June’s meeting of the bloc’s leaders. The EU's chief Brexit negotiator Michel Barnier has told the UK "that the time has come to make a choice" on the customs union.